This one was different for us. With transplant #1 we at least knew something about our donor family within hours. A couple days later, I attended the funeral for David Lindemann and saw his parents, Gary and Sarah, from a distance. We would meet one year later. During recovery following Trenton’s second transplant, Valerie kept herself occupied and connected to the real world through the internet. She came across a news story in which a young man was shot, taken to Baylor and passed away not long before Trent’s surgery. We were confident she had found the donor. A few months later, however, in a Baylor hospital video created about Trenton, we learned the heart had come from over eight-hundred miles away. Now we were uncertain. Approaching the one-year anniversary, we wanted our donor family to know their impact had reached beyond our family by asking friends to write notes and cards of comfort which we included with our own note of thanks, telling them about Trenton. That was all we knew and it stayed that way until just prior to the three-year anniversary of Trent’s transplant. May 18th at 5:15 PM was a wild emotional ride. As usual, Valerie greeted me at the door, but was in my face immediately. “We got our donor letter” she whispered excitedly. I followed her in as she flipped through the papers. She was sharing what she had just read, but I wasn’t listening; I wanted to read it for myself. Forgive my tardiness in responding to your letter, but it was very difficult for me to write about my angel, Alberto. I am filled with much joy knowing that the young person that received my son’s heart is of the same age. 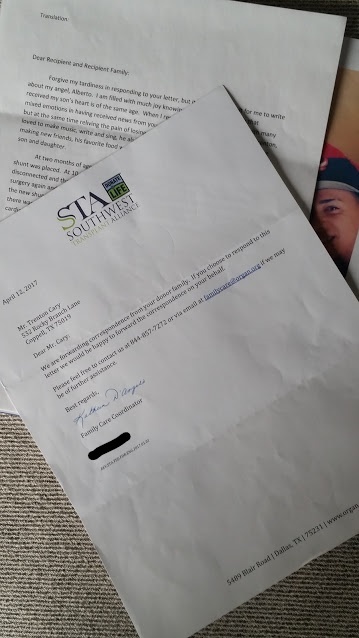 When I received your letter I was filled with many mixed emotions in having received news from you and learning how well it’s going for Trenton, but at the same time reliving the pain of losing me child. About Alberto I will tell you that he loved to make music, write and sing, he also played basketball, shy yet always happy, he liked making new friends. His favorite food was pasta and had a lovely family composed of his wife, son and daughter. At two months of age Alberto was diagnosed with Hydrocephalus, was operated and a shunt was placed. At 10 years of age they had to operate again due to the shunt having been disconnected and thank God all went well. At age 15 the shunt disconnected again and had surgery again and all tuned out well. In 2012 he had to be operated on four occasions due to the new shunt not functioning properly, in 2013 all went well, but in 2014 the shunt failed and there was not opportunity for him to be operated again due to his having convulsions, went into cardiac arrest and resulted in Brain Death. I am very happy that the Gift of Life that Trenton received through my angel Alberto is going well. Trenton keep moving forward, our family is anxious to meet you. We want to know if you have made all of your dreams come true. I hope that one day we can get to know each other and that you can meet the two little angels that he left behind; I have sent you a picture of him with his wife and children. We continued sitting on the couch together, soaking it in, rereading the message, staring at the picture of Alberto and his family. We were (Still) thankful to finally know and learn about him, and we felt their pain, and our guilt, over their lowest low being our highest high. One of my most difficult blogs to date coming next time, and how I can be Still Thankful.